In this assignment we'll add a Rigidbody 2D to our player so that they can moved using physics and write a simple C# script to allow us to move the player around the play field. Now we're going to move the Player game object. 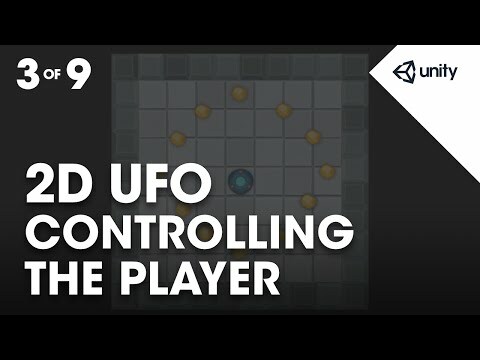 want this Player game object to behave. not fly off in to space. game objects and pick them up when we do this. Unity has two physics systems. One for 2D and one for 3D. not interact with each other. needs to have a Rigidbody2d component attached. in this case we'll select our Player game object. in the inspector, choosing Rigidbody2d. components for our game type. in the upper-right of the component. the Player object in the scene. that we attach to the Player game object. Let's create a new C# script. to create our new C# script. and use the Add Component button in the inspector. and attach a script in one step. and then click on Create and Add. to the selected game object. or top level of our project view. maintain an organised project view. use the context sensitive gear menu. in our preferred script editor. code provided in the base script. what do we want to do with this script? Player game object every frame as movement. Where will we check for and apply this input? and this is where our physics code will go. meaning that this is physics. in this case is irrelevant. We're going to put our code in FixedUpdate. to want to put in FixedUpdate? but how do we find out more? that searches the Unity API. and then press the ' key. in our documentation related to Input. in to the Input system. This brings up the page on Input. This is the page on the Input class. understand how to use the class. Player on all platforms, including mobile devices. list of class variables and class functions. or a reference to the default gyroscope with gyro. The class functions do something for us. on the function or variable. We will be using C#. Now we can delete the Input line. our Player through the keyboard. by the keys on the keyboard. interacts with the 2D physics engine. and move the Player game object in the scene. First type Rigidbody2d in to our script. with a search term Rigidbody2d. This brings up the Rigidbody2d page. available to the Rigidbody2d class. find the one we want. In this case let's choose AddForce. This adds force to the Rigidbody2d. As a result it will start moving. to add force to our Rigidbody2d. on both the X and Y axis. All of our documentation pages are linked together. components on our game object. to our Player game object. another component on the same game object. and we'll set this reference in the Start function. Let's return to our script. to create the variable to hold the reference. rb2d.AddForce and then some vector2 value. in to a vector2 value? that's made up of an X and a Y.
we will add to our UFO. What is our X value? add force moving the UFO to the left or right. or the console, and there are none. Now let's test what we've written. immediately flies downward off the playing field. top-down view this doesn't make any sense. because we don't have to deal with gravity in our physics. Now play again and test. the UFO moves in the scene. but the basic concept works 100%. To stop testing exit Play mode. the speed of the UFO. Let's create a public float called Speed. make all of our changes in the editor. Let's now multiply movement by speed. Let's save these changes and return to Unity. now has a Speed property. Let's set this property to 1000. Play the scene and test. But changes are fast too. change the value to 10.
fly through the walls, which is not what we want. In the next lesson we'll add collision detection.